In April of 2008, Collaborative Design Studio was awarded the exciting UNR Living Learning Center, a new development for student housing and learning on the University campus. Integrating spaces for living with academic advising; the UNR Living Learning Center is much more than standard "student housing." The project consists of a new undergraduate residence for 300 students; and approximately 10,000 sq ft of academic/faculty space with smart classrooms and faculty residences. 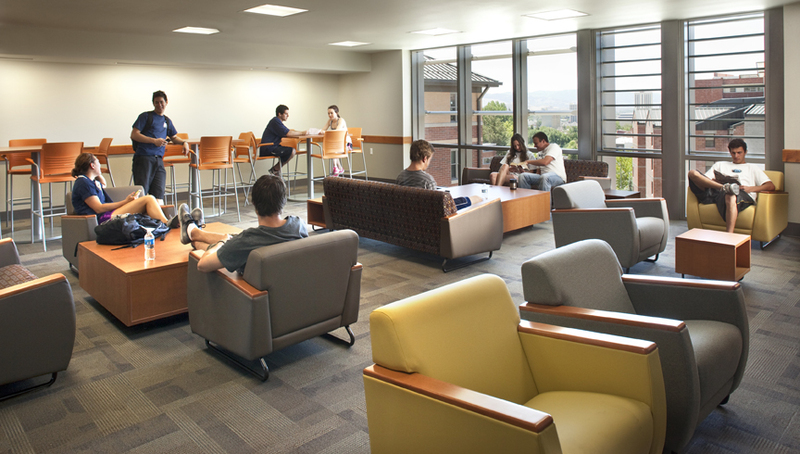 The student suites are designed as "modules" clustered around common lounges and study spaces. The design incorporates "green principles" throughout. In part, it is the development and refining of a new design concept being applied to student housing that is designed to be a hub for intellectual interactions. One that complements both residential life and social dynamics, an environment that supports that process. The completed design reflects the ever-changing roles that residences play in the collegiate experience and incorporates progressive ideas into the architecture. Collaborative Design Studio teamed with the national firm WTW Architects on this project. Doors of the new Living Learning Center opened in 2011. The project was award LEED Silver Certification in 2012.